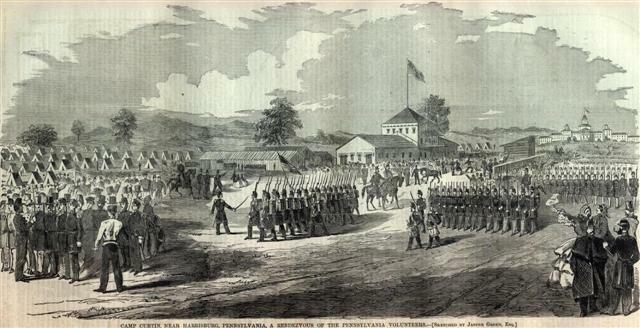 WE publish herewith, from a drawing made on the spot, an illustration of Camp Curtin, a rendezvous of the Pennsylvania Volunteers. At this place Governor Curtin is understood to have collected some eight or ten thousand volunteers, and more are flocking in daily—horse, foot, and artillery. A large number of experienced drill-sergeants are busy from daylight till dark drilling the men, who go through the unaccustomed labor with cheerfulness, and only ask to be led forward. A gentleman who has just returned from Harrisburg writes as follows respecting the other camps of the Pennsylvania troop.
" This State has in the neighborhood of seventeen thousand already in the field, and thousands more begging for the opportunity of marching. They have full six thousand stationed at Camp Scott, near York, under the command of Generals Wynkoop and Negley. There are twenty-six hundred at Camp Slifer, near Chambersburg, under the command of General E. A. Williams, one of the officers of the Pennsylvania volunteers in the Mexican War, who has Colonel J. J. Patterson for his aid. Scattered along between Elkton, Perryville and Philadelphia are six thousand more, and there are one or two regiments from Ohio near Lancaster, with some twelve hundred United States troops at Carlisle Barracks." Fifty-first Infantry.-Cols., John F. Hartranft, Edwin Schall, William J. Bolton; Lieut.-Cols., Thomas S. Bell, Edwin Schall, William Allebaugh; Majs., Edwin Schall, William J. Bolton, Lane S. Hart, Joseph K. Bolton. This regiment was recruited during the summer and fall of I86I by Col. Hartranft for three years' service, most of the officers and men having served for the three months' term. Cos. A, C, D, F and I were recruited in Montgomery county; E, H and K in Union and Snyder; G in Center and B in Northampton. 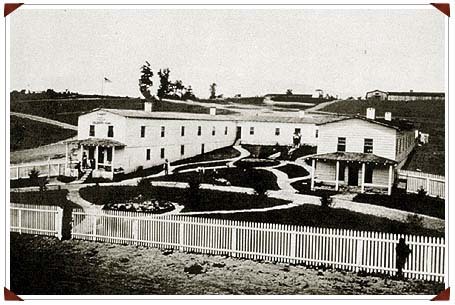 The place of rendezvous was Camp Curtin, Harrisburg, and the regimental organization was completed on Nov. I6 I86I. Two days later it left for Annapolis, Md., where it remained, perfecting itself in drill and discipline, until Jan. 6, 1862, when it was assigned to the 2nd brigade (Gen. Reno), Burnside's corps, embarked as a part of Burnside's expedition to North Carolina, and landed at Roanoke island on Feb. 7. It shared in the capture of the enemy's works here on the 8th and was active at the battle of New Berne, N. C., in March, where it executed a gallant charge. It was again active in the battle of Camden, losing 3 killed and 21 wounded. The command suffered severely in the fierce fighting at Fredericksburg in December, its losses being I2 killed and 74 wounded. It was ordered to Fortress Monroe in March, 1863, brigaded with the 51st N. Y., 2Ist Mass., and IIth N. H., and moved thence, with two divisions of the 9th corps, to Kentucky, being posted successively at Winchester, Lancaster, Crab Orchard and Stanford. 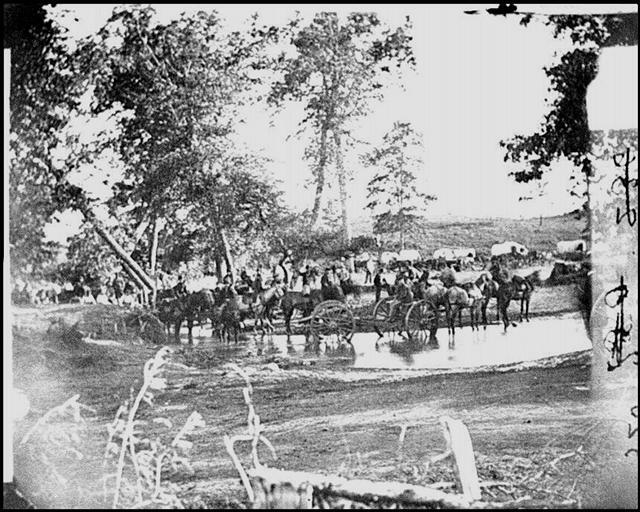 In June it moved with its corps under command of Gen. Parke to the support of Grant at Vicksburg, arriving on the I4th and going into camp at Mill Dale. It was employed here and at Oak ridge for several weeks in building fortifications, and joined Sherman in his campaign to Jackson (my note - is this a mistake? Was Sherman not in Jackson in May? http://www.raymondms.com/battle2.htm) in July. The command then returned to Kentucky, encamping at Camp Nelson, where it rested and refitted after its arduous service in Mississippi. The regiment moved from Camp Nelson to Crab Orchard, where a number of recruits were received, and thence to Knoxville, Tenn. It was active at the battle of Campbell's station, and suffered all the hardships endured by Burnside's army, when besieged in Knoxville by the enemy under Longstreet. After the siege was raised it joined in the pursuit of the enemy, skirmishing with his rear-guard at Rutledge, and later went into winter quarters at Blaine's cross-roads, where the men suffered much from the meager supplies of food and clothing received. 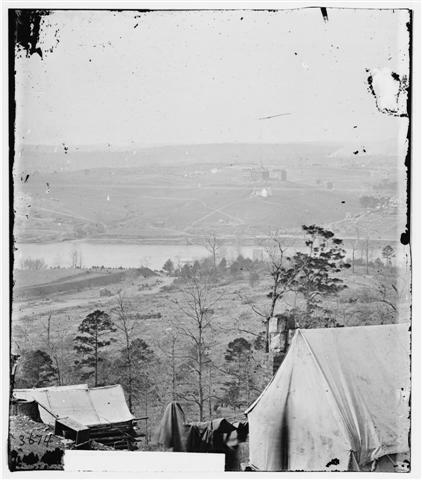 "Environs of Knoxville seen from South Bank of Tennessee River, East Tennessee University in Middle Distance - Knoxville, TN "
On Jan. 5, 1864, the regiment reenlisted for a term of three years and returned to Pennsylvania on 30 days, veteran furlough. 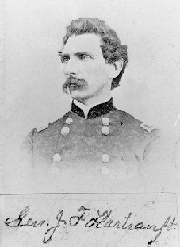 While at home the command was rapidly recruited to the maximum strength, as it was a very popular organization, and on the expiration of its furlough it proceeded to Annapolis, where it was assigned to the Ist brigade, Ist division, 9th corps, Col. Hartranft commanding the brigade and Lieut.-Col. Schall the regiment. 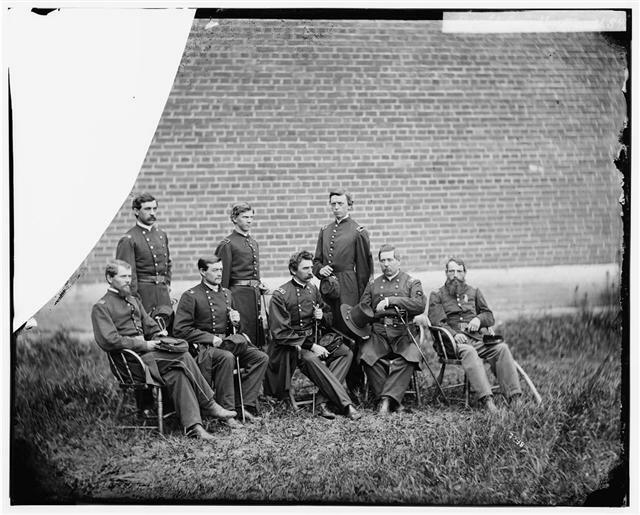 "General John F. Hartranft and Staff (responsible for securing the conspirators at the Arsenal) - Washington, D.C. Washington"
The 5Ist participated in all the sanguinary engagements leading up to the siege of Petersburg, losing heavily. Dating from the battle at the Ny river, May I2, Col. Hartranft was promoted to brigadier-general, Lieut.-Col. Schall became colonel, Maj. Bolton lieutenant-colonel, and Capt. Hart major. 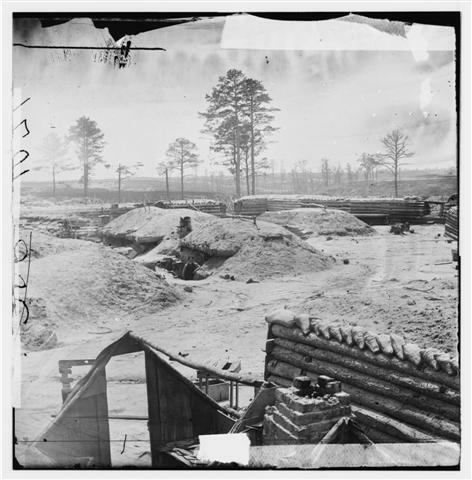 In the fierce fighting at Cold Harbor Col. Schall was killed while leading a charge and was succeeded in command by Lieut.-Col. Bolton. The command arrived in front of Petersburg on the I7th and at once engaged the enemy. It was in action again the next day, capturing and holding a position close to the enemy's works. This position was so exposed that a constant fire was kept up, night and day, for more than two weeks, one-third of the men being constantly employed to hold the position. It formed part of the assaulting column at the explosion of the mine, but was ordered back before it entered the crater. In this advance, Col. Bolton was severely wounded and Maj. Hart succeeded to the command. The regiment remained on duty in front of the crater for a few days, when it was relieved, and remained encamped in the rear until Aug. I9. It shared in the movement for the capture of the Weldon railroad, and participated in all the subsequent operations of the brigade, including the engagements at Poplar Spring Church, Ream's station, Hatcher's run, and the final assault on Petersburg, April 2, 1865. It was mustered out at Alexandria, Va., July 27, 1865, after four years of most trying service. Fought on 08 February 1862 at Roanoke Island, NC. Fought on 19 April 1862 at Camden, NC. Fought on 30 August 1862 at 2nd Bull Run, VA. Fought on 14 September 1862 at South Mountain, MD. Fought on 17 September 1862 at Antietam, MD. Fought on 13 December 1862 at Fredericksburg, VA. Fought on 30 March 1863 at Columbus, OH. Fought on 15 July 1863 at Milldale, MS. Fought on 23 November 1863. Fought on 27 November 1863. Fought on 29 November 1863 at Knoxville, TN. Fought on 01 December 1863. Fought on 13 December 1863 at Clinch Mountain, TN. Fought on 14 December 1863. Fought on 06 May 1864 at Wilderness, VA. Fought on 07 May 1864 at Wilderness, VA. Fought on 12 May 1864 at Spotsylvania Court House, VA. Fought on 13 May 1864 at Spotsylvania Court House, VA. Fought on 14 May 1864 at Spotsylvania Court House, VA. Fought on 19 May 1864 at Po River, VA. Fought on 21 May 1864. Fought on 27 May 1864 at North Anna River, VA. Fought on 01 June 1864 at Cold Harbor, VA. Fought on 02 June 1864 at Cold Harbor, VA. Fought on 03 June 1864 at Cold Harbor, VA. Fought on 06 June 1864. Fought on 07 June 1864. Fought on 16 June 1864. Fought on 17 June 1864 at Petersburg, VA. Fought on 18 June 1864 at Petersburg, VA. Fought on 20 June 1864 at Petersburg, VA. Fought on 21 June 1864 at Petersburg, VA. Fought on 29 June 1864 at Petersburg, VA. Fought on 01 July 1864 at Petersburg, VA. Fought on 05 July 1864 at Petersburg, VA. Fought on 06 July 1864 at Petersburg, VA. Fought on 07 July 1864 at Petersburg, VA. Fought on 08 July 1864 at Petersburg, VA. Fought on 15 July 1864 at Petersburg, VA. Fought on 16 July 1864 at Petersburg, VA. Fought on 30 July 1864 at Petersburg, VA. Fought on 31 July 1864 at Petersburg, VA. Fought on 19 August 1864 at Weldon Railroad, VA. Fought on 20 August 1864 at Weldon Railroad, VA. Fought on 21 August 1864 at Weldon Railroad, VA. Fought on 30 August 1864 at Petersburg, VA. Fought on 27 October 1864 at Hatcher's Run, VA. Fought on 08 December 1864 at Petersburg, VA. Fought on 13 February 1865 at Petersburg, VA. Fought on 24 February 1865 at Petersburg, VA. Fought on 25 March 1865 at Petersburg, VA. Fought on 01 April 1865 at Petersburg, VA. Fought on 02 April 1865 at Petersburg, VA. 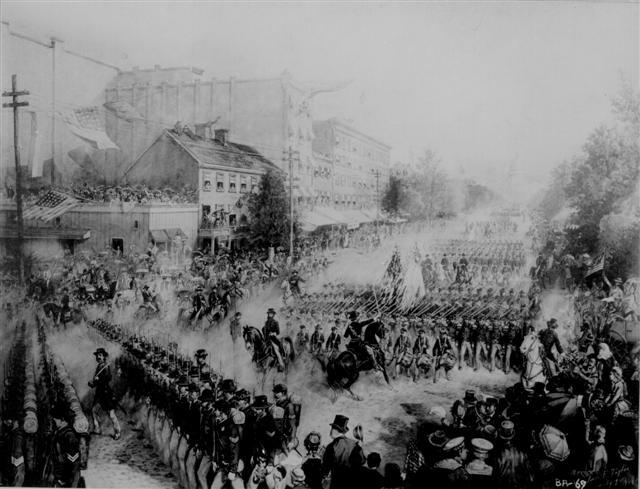 Organized at Harrisburg November 16, 1861. Left State for Annapolis, Md., November 16. Reno's Brigade, Burnside's North Carolina Expeditionary Corps, to April, 1862. 2nd Brigade, 2nd Division, Dept. of North Carolina, to July, 1862. Army of the Ohio to June, 1863; Army of the Tennessee to August, 1863, and Army of the Ohio to April, 1864. 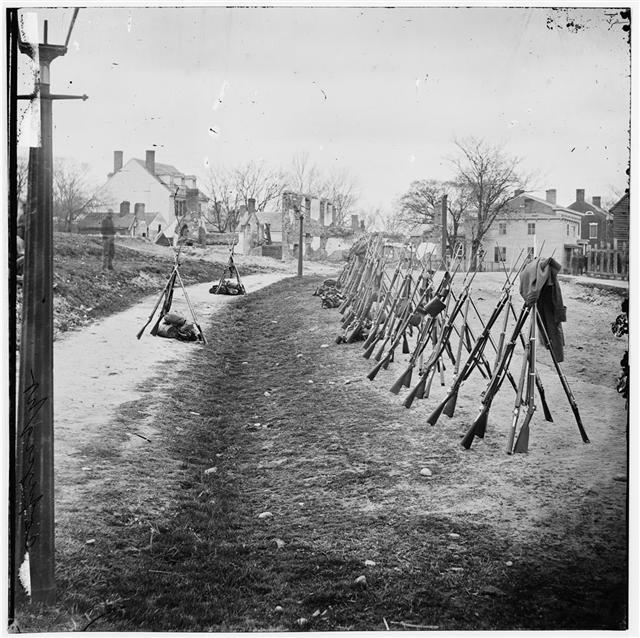 1st Brigade, 3rd Division, 9th Army Corps, Army Potomac, to September, 1864. 1st Brigade, 1st Division, 9th Army Corps, to July, 1865. --Duty at Annapolis until January 9, 1862. Burnside's Expedition to Hatteras Inlet and Roanoke Island, N. C., January 9-February 8. Battle of Roanoke Island February 8. Moved to New Berne March 11-13. Battle of New Berne March 14. Expedition to Pollocksville March 21-22. Expedition to Elizabeth City April 17-19. Camden, South Mills, April 19. Duty at New Berne until July. Moved to Newport News, Va., July 6-9, thence to Fredericksburg August 2-4. March to relief of Pope August 12-15. Pope's Campaign in Northern Virginia August 16-September 2. Battle of South Mountain September 14. Duty at Pleasant Valley until October 27. Movement to Falmouth, Va., October 27-November 19. Battle of Fredericksburg, Va., December 12-15. Burnside's second Campaign. "Mud March" January 20-24, 1863.
thence to Covington and Paris, Ky., March 26-April 1.
and to Crab Orchard May 23. Movement to Vicksburg, Miss., June 3-17. Siege of Vicksburg June 17-July 4. Advance on Jackson, Miss., July 5-10. Siege of Jackson July 10-17. At Milldale until August 6. August 6-20. Duty in Kentucky until October. Operations in East Tennessee until November 14. Knoxville Campaign November 4-December 23. Siege of Knoxville November 17-December 4. Pursuit of Longstreet December 5-29. Regiment reenlisted January 1, 1864, and on Veteran furlough January 11-March 9. At Annapolis, Md., until April 23. Rapidan Campaign May 4-June 12. Spottsylvania C. H. May 12-21. Assault on the Salient May 12. North Anna River May 23-26. Line of the Pamunkey May 26-28. Poplar Springs Church, Peeble's Farm, September 29-October 2. Reconnaissance on Vaughan and Squirrel Level Road October 8. Boydton Plank Road, Hatcher's Run, October 27-28. Pursuit of Lee to Farmville. Moved to City Point, thence to Alexandria April 20-28. Duty at Washington and Alexandria until July. Mustered out July 27, 1865. Regiment lost during service 12 Officers and 165 Enlisted men killed and mortally wounded and 137 Enlisted men by disease. Total 314.